Wasn't going to B+W originally, but we left the camera bag lying on the grass in the background: it's bright red - and no amount of cropping or desaturating would get rid of it...since this is Basic, I couldn't rest with a red blob in the background (try as I might I couldn't see it passing for a flower)...so B+W it had to be. Rather pleased with the result though. This is off the original (slight crop has just happened)... see the camera bag? WOW! Thanks for the comments and the third place everyone. This is very exciting!! B&W for this image is just perfect! I think the color version is not nearly so special. classic! great processing..love the bag story! great shot! it's a good thing that you left your red bag in the picture, because I like your BW version so much more than the color one :). Great work, congrats on the third place! Congratulations on the Ribbon with this wonderful capture!! Congratulations on 3rd place. Strong emotive shot. wow what a big difference the b&w makes, this picture turned out great!!! Oh, how BEAUTIFUL! What an excellent choice and perfect execution for this challenge! Congratulations on your yellow ribbon. Originally I was thinking I liked your wings version better, but now I'm thinking I like this one better. But does it really matter, both are wonderful photos. Congratulations on winning the yellow ribbon! what a lovely juxtaposition, the little carefree gal in the midst of all that reverence! well deserved ribbon! good for yoU! Congratulations on your ribbon. excellent image! Congrats on your ribbon! I would love a print of this photo to hang in my home. Well done! Very nicely done, so much sense of gravitas and place. A welcome change from the spectacular that so often dominates our ribbons. I recognized this place immediately from your "wing" entry. What a cool place to shoot and your work is fantastic. Well done. Congratulations on your ribbon with this beauty, Caroline. very worthy winner, great to see. Wonderful image. Love the almost-sepia. Lovely documentary photo. Perhaps those are late spring bulbs flowering? The richness of textures makes for a nice viewing experience. 9. The best of all that I've seen so far!! Excellent composition and the black and white is great!! Good composition, nice B&W. Good contrast and depth. Beautiful, the use of B&W really unifies the image. Wow! The amount of feeling in this photo is phenomenal. Well done! What a rich mixture of subjects! I love that anyone looking at this can wander between childhood, death, nature, and the church. Beautiful picture. Great shot. One of my faves of the challenge. I love the balance of moods. A bit depressing with the location but carefree with the young girl almost frolicking through the stones. Well done. Bumping up. 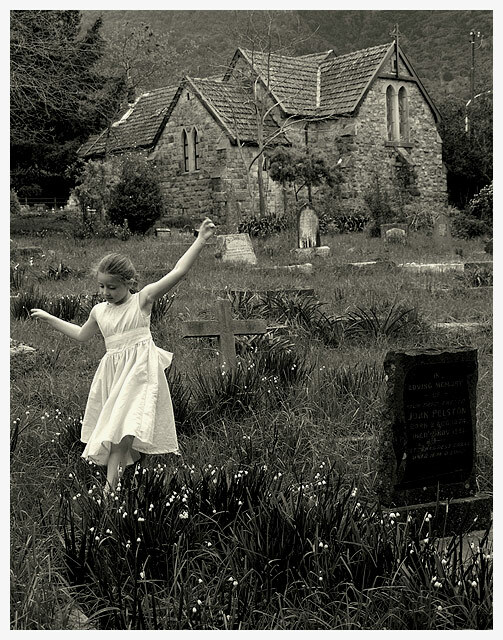 The concept of dancing in the graveyard freaks me out, but I like the shot nonetheless. Proudly hosted by Sargasso Networks. Current Server Time: 04/21/2019 02:11:17 PM EDT.